So far, the 2018 UCI World Road Championship has given us a lot of epic women’s cycling. The event, taking place in Innsbruck, Austria, will culminate in this weekend’s final road race. With the riders starting stronger and going faster than ever before, these women continue to make a solid case for the need for more coverage of their sport. 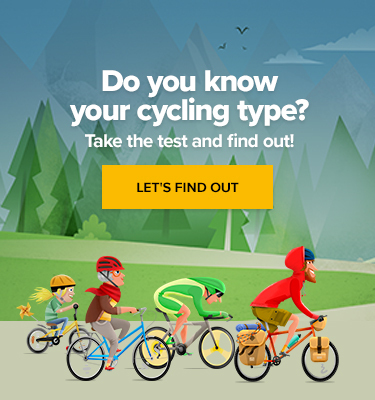 This is a topic the UCI is known to dance around and, as is the case with other races, gender equality at the World Championships is a story of both progress and lingering frustration. Slow to bring any women’s events to their line-up, the UCI finally introduced a women’s road race in 1958, 31 years after the men’s event which began in 1927. Nevertheless, 60 years ago exactly, Elsy Jacobs of Luxembourg became the first women’s world champion when she beat Tamara Novikova and Mariya Lukshina of the Soviet Union on the roads of Reims, France. Women’s cycling has certainly come a long way since then and the UCI has slowly been making adjustments that have helped move the women’s programme towards something closer to equality. Until about 1990, the women’s race varied in length from a low of 46.6 km in 1966 to around 72 km. From 1991, the race length began to gradually increase, first to 79 km in Stuttgart, Germany, to over 100 km in 1996’s race in Lugano, Switzerland. It has since been on the up, with this year’s final road race event clocking in at 156.2 km, still over 100 km less than the men’s 258.5 km. 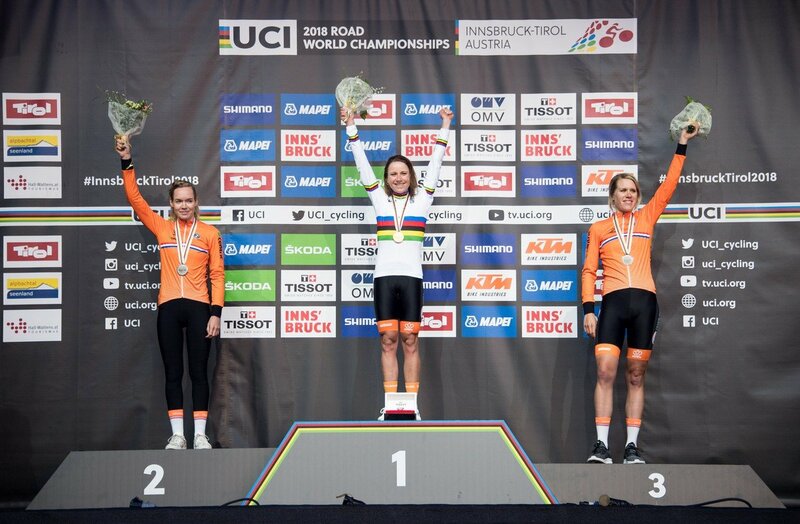 Next up on Monday, Rozemarijn Ammerlaan of the Netherlands claimed the first rainbow jersey of the 2018 Championships, winning the junior women’s individual time trial over Camilla Alessio of Italy. The 18-year-old told Cycling News that she was surprised and delighted by the win. “I didn’t expect this, I don’t have any words for it.” Followed onto the podium by three more of her countrywomen the next day, Ammerlaan’s completion of the 20km race in 27.02, suggests that the dominance of Dutch riders is something we can expect to see more of in the future. Tuesday brought more speed and few surprises. Annemiek Van Vleuten was heavily favoured to win the women’s time trial and did so decisively. Accompanied on an all-Dutch podium by Anna van der Breggen and Ellen van Dijk, Van Vleuten who turns 36 in two weeks, shows no sign of slowing down. Largely considered to be the best female rider in the world, her last couple seasons have been exceptional. Taking La Course, the Giro, and the Boels Ladies Tour – the latter two with three stages wins along the way, she’s been unstoppable in 2018. Thursday brought us the junior women’s finals, with an impressive win by Austria’s own Laura Stigger. In only her second road race, mountain biker Stigger took home the rainbow jersey after winning the junior cross-country title earlier this month. 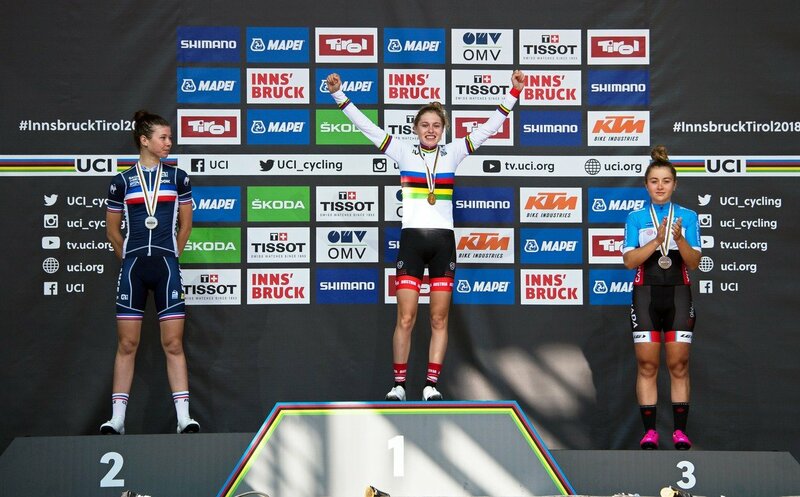 So, with such a vast array of talent on display from the women, as we wonder who will claim the final two rainbow jerseys this weekend, it’s hard not to think about the discrepancies in the course. 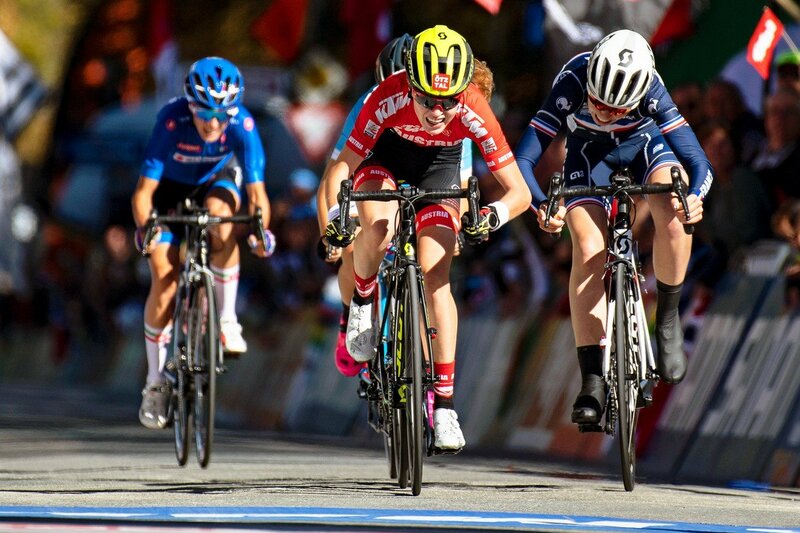 Taking place on Saturday and Sunday respectively, both the elite women’s and men’s road race start in Kufstein, taking in an opening leg of 84.7 km before crossing the line in Innsbruck and entering the final circuit. The women will ride that 23.8km circuit three times and the men six. However, while the women finish after that third loop, the men then embark on a final long loop, including the “Hell Climb” to Gnadenwald. With sections of this climb approaching 28 per cent gradient, overall the 2.6km ascent averages 10.5 per cent. It’s safe to say this element will add to the race’s drama, a spectacle that the women, unfortunately, won’t be part of. Cecilie Uttrup Ludwig told Cycling News in June, when the course was announced, that it’s “sad and incomprehensible” to see a major difference between the men’s and women’s Innsbruck-Tirol courses. Her big question was the reasoning behind it, “Is it because [they think] we are too weak or are we not capable of doing such hard climbs?” she asked. Although we’re wondering the same thing, it’s not to say that the course which awaits the women on Saturday is anything to scoff at. The drama of the “Hell Climb” will be left to men this time around, but we’ve no doubt that intensity and excitement won’t be on short supply when the women take to the road to cap off the 2018 racing season. Let’s just hope that’s one more reason for UCI to rethink the way they structure the women’s course in the future.